The low carb craze has made superstars out of some vegetables that at best were used to torture children in a previous life. Kale. Seriously. Kale. The only way kale is good is when it is cooked for a very long time in a ham hock gravy or in Kale and Andouille Soup. There, I said it. Kale becomes tolerable when cooked within an inch of its life and paired with a smoked pork product. The next vegetable up for abuse is the poor man’s broccoli, cauliflower. 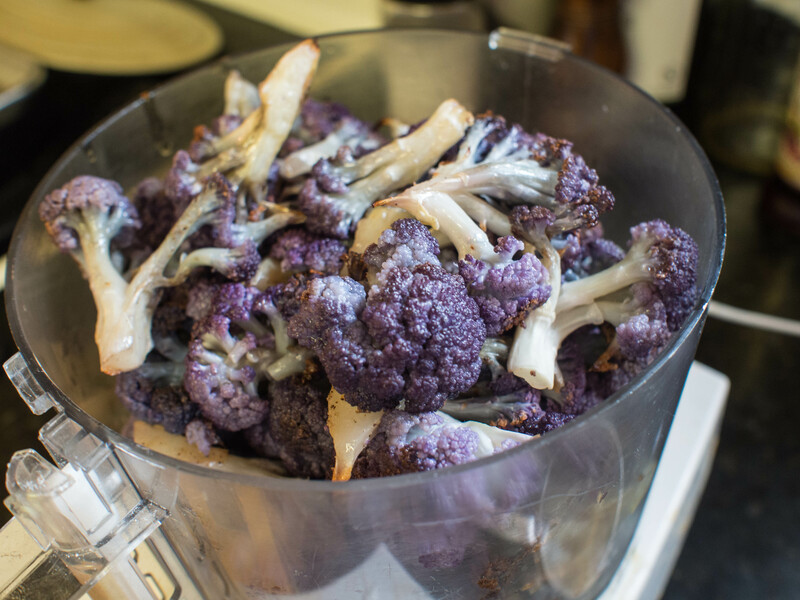 Cauliflower is tolerable when you add a signficant amount of dairy products to the mix. I’ve made cauliflower puree, which can double as a quasi mashed potato substitute. Cheesy cauliflower patties are now starting to trend, which would be the logical progression. When I was a kid, my mom would make potato pancakes out of left over mashed potatoes. After fending off dinosaur attacks, of course. So, why not try to make fried patties out of cauliflower? Well, cauliflower has no starch. It also contains a lot of water. You need a lot of help to make these suckers stick together. This “help” likely defeats the purpose of choosing cauliflower, because it either adds carbs or gluten. On the plus side, it’s probably far more healthy than what you were going to eat, even with the add-ins. 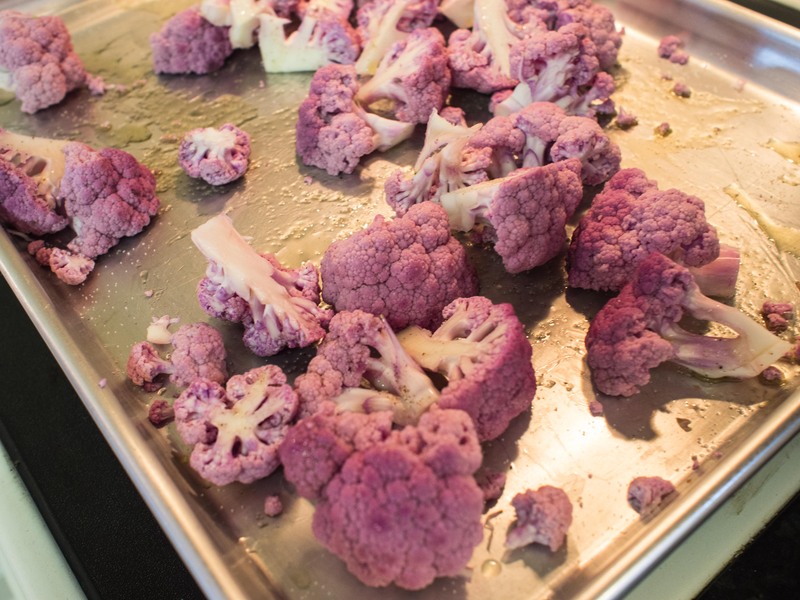 I saw purple cauliflower in the store and thought that maybe such a cool color would inspire the kids to give the dish a try. My daughter did try it and didn’t really like it. Son and husband really liked it, as long as I didn’t try to say it was something that it wasn’t. In other words, these were very good cheesy cauliflower patties. 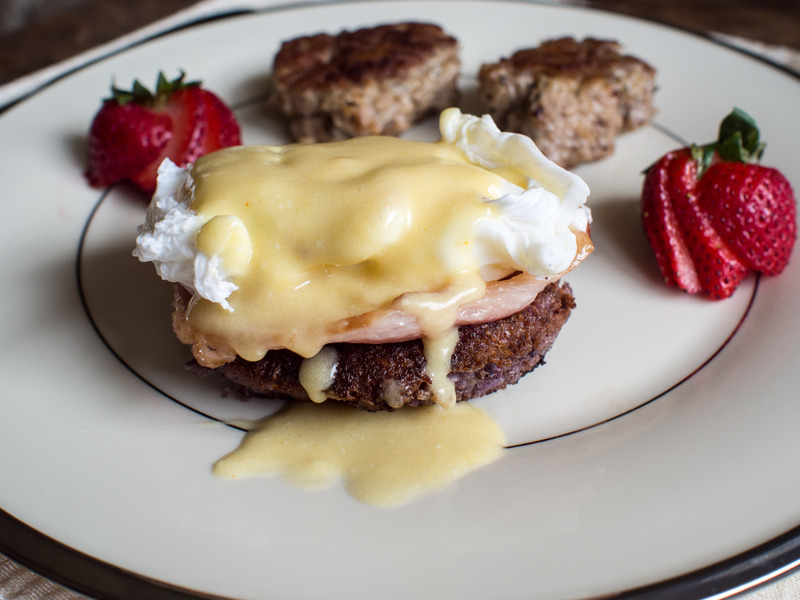 As you can see above, I subbed the patties out for English muffins in Eggs Benedict. These were really good. A savory, cheesy bottom that you didn’t have to fight with, complimented the poached egg and Canadian bacon really well. As a bonus, no need for asparagus, there was already plenty of veg on the plate! The other time I used it, it was a vegetable for dinner. 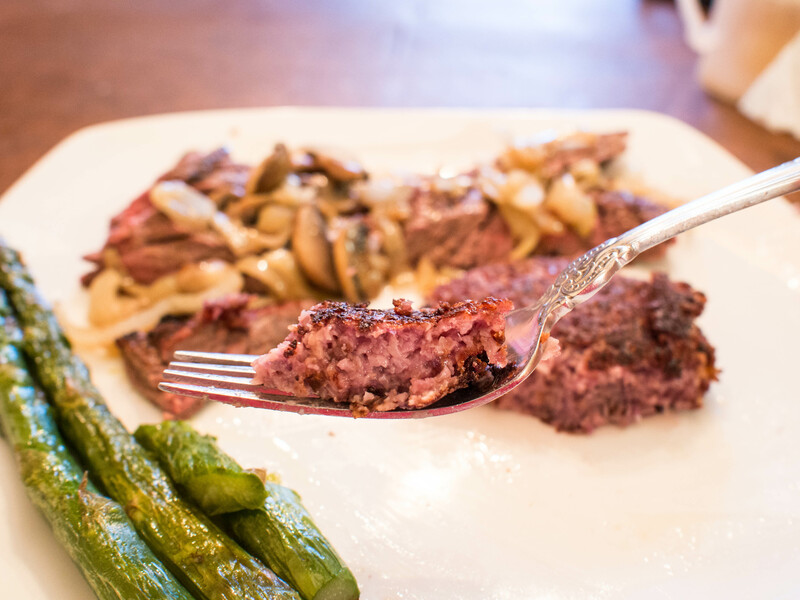 The patty served as a very nice compliment for my steak dish! I liked it and would make it again. Definitely a different take and something to shake up the veggie routine in our house. As a bonus, very easy to make! Place all ingredients, except the butter, into food processor. Pulse until the cauliflower is coarsely ground. Remove mixture from processor and form into patties. The smaller and thinner the patties, the more likely they are to maintain their shape. In a heavy bottomed skillet, over medium heat, melt the butter. When the butter just starts to foam, add the patties, careful not to crowd. 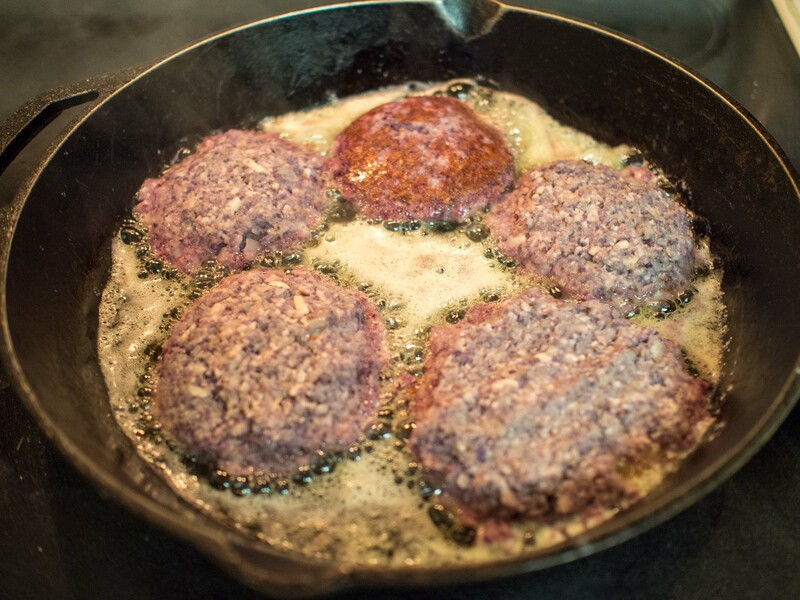 When the patties are browned, carefully flip and cook until the other side is browned as well. About 3 minutes each side. Serve as desired. Note: I roasted the florets at 375 degrees fahrenheit in olive oil, sprinkled with salt and pepper for about 25 minutes, turning once. This entry was posted in Low(er) Carb, Sides, Vegetable Side and tagged cauliflower, cheese, easy, Low Carb, patties on April 24, 2014 by dawn of food. I’m on quite a tear. Chocolate everywhere. I am supposed to be eating healthier. The whole point of this blog was to eat simply. Here I am pimping out muffins, fancy waffles and shortbread. 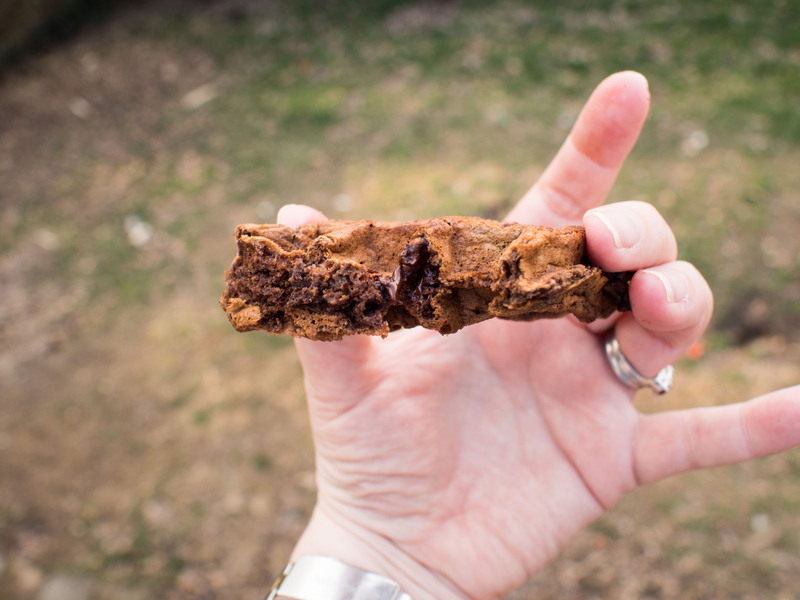 On the other hand, as I have reviewed my blog progress over the course of the last year my biggest view-getting posts were: Pizza Fondue, Waffles, and Maryland Fried Chicken. My readers want what they want! Also, these items are so much easier to photograph well. 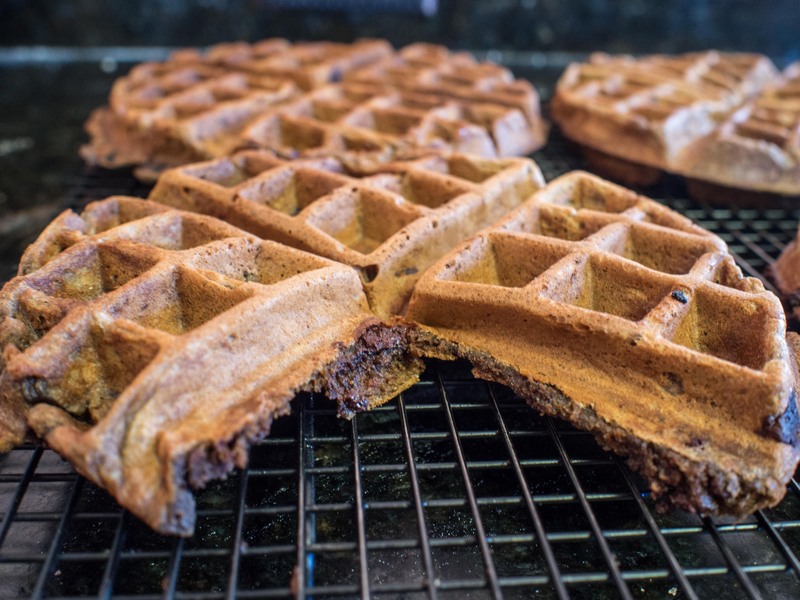 I have tried Chocolate Chocolate Chip Waffle recipes and all promised that they weren’t “too sweet”. Indeed, they weren’t. They were terrible. Like when you sneak a bit of unsweetened chocolate for the first time. Ick. Chocolate needs sugar. It just does. Also, it’s breakfast. People eat doughnuts, French toast, pancakes, crepes, muffins, pastries and all sorts of sweet things for breakfast. It won’t kill people to put a touch of sugar in chocolate waffles. Plus, Chocolate is virtually a health food anymore. I borrowed parts of this recipe from epicurious.com. I altered it quite a bit to add more sugar and swap out the olive oil for butter. Olive oil in waffles? Just no. 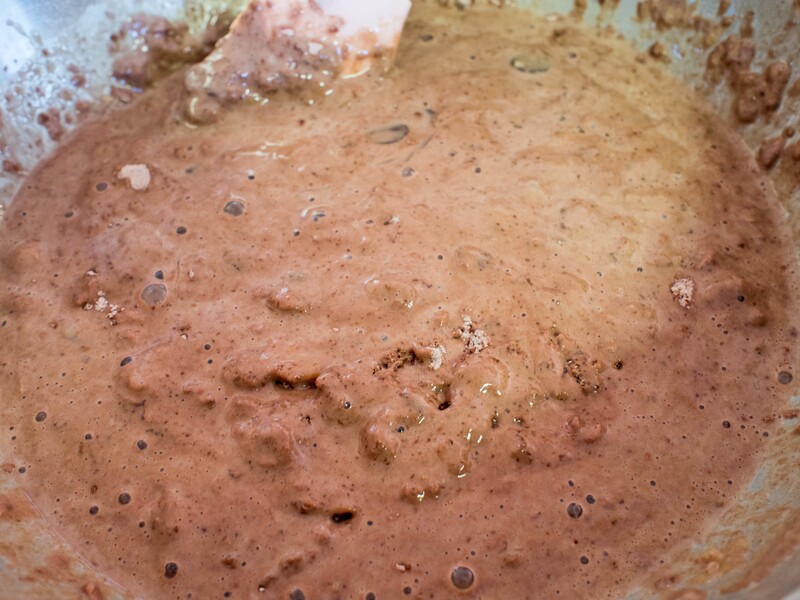 Whisk together the flour, cocoa, sugar, baking powder, baking soda and salt. Combine eggs, buttermilk, and vanilla. Combine the dry ingredients with the wet ingredients until just combined. Stir in the chocolate chips. Spray the waffle iron with the oil spray and cook the waffles according to your iron’s instructions. This entry was posted in Breakfast, Breakfast/Brunch on April 13, 2014 by dawn of food. My kids were getting tired of waffles for breakfast on school mornings. Really, really tired. But they are so easy. You make them on the weekend, freeze them, pop them in the toaster and serve with “breakfast meats” you reheated because the hubs made them the night before and BAM! breakfast complete. A seriously 5 star breakfast complete, if I do say so myself. But, repetition has a price. Boredom. So, I tried pancakes. They were fine, but didn’t store particularly well. Couldn’t really separate them as nicely as the waffles. The kids then came to a bit of an impasse. 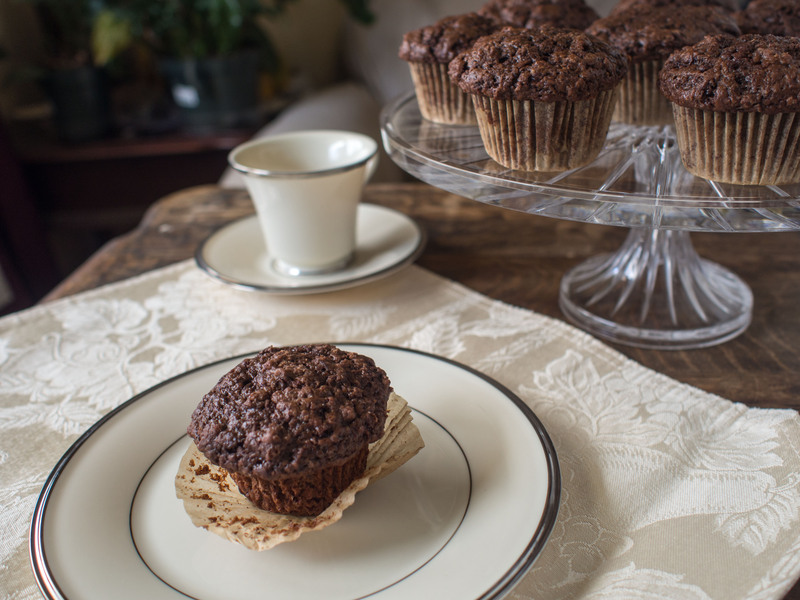 They could agree on nothing, until I came across a recipe for Chocolate Chocolate Chunk Muffins. Well, what’s not to like? To quote Cosby, it has wheat, eggs and milk! Must be good for you! The recipe was originally from Dorie Greenspan’s Baking from My Home to Yours. She is one of my favorite cookbook authors. I found it on the Brown Eyed Baker’s blog. I made a very few changes because Dorie Greenspan’s command of baking is just extraordinary. Just reading the ingredients was a joy because you could see how they all fit together and their purpose. I have one little change. For whatever reason, buttermilk recipes are never quite right for me. The batter is always too dry. When I substitute milk and vinegar, it seems to work quite well. I’ve tried all brands of buttermilk and find that I have to add more liquid. Plus, buttermilk comes in quarts and I always need 1 1/4 cups or something like that. What do you do with the rest? Make the recipe again? Milk is just more versatile and I don’t throw it away like I do buttermilk. Ok, I lied. I have two changes. I’m not breaking up some fancy, expensive chocolate for this recipe. Bittersweet chocolate chips are just fine! Also, and I’ve mentioned this before, I scoff at melting chocolate over the double boiler. ESPECIALLY when I’m melting it with butter. Put a dishwasher and microwave safe plate in the microwave and nuke for a few minutes on low power. Done. Stir, use mixture, and place in dishwasher. No messy cleanup of several bowls and pans. Preheat oven to 375 degrees Fahrenheit. Line muffin pan with liners. Set aside. Place 2 ounces of the chocolate and all of the butter in a microwave safe bowl. Over low power (50% or less), microwave the chocolate and butter in small increments until just melted. For my microwave, I started with 60 seconds on 50% power. Stirred the items, then another 30 seconds on 50% power and the mixture was melted. Stir between each increment, as chips can retain their shape not appear “melted”. Set aside. Or, feel free to use the double boiler method. Whisk flour, sugar, cocoa, baking powder, baking soda and salt together in a large mixing bowl. In a large liquid measuring cup, combine milk and vinegar. Let sit for 5 minutes. Stir. Add egg and vanilla extract. Pour the melted chocolate mixture and the buttermilk mixtured into the flour mixture. Gently stir together until just blended. I found the mixture to have a mousse-like quality, much more so than a batter quality. Add the remaining chocolate and stir gently. Divide equally among the muffin cups. Bake for 15-20 minutes until a tester inserted into the center of the muffin comes out clean. Remove from oven and cool in a baking rack for at least 5 minutes. This entry was posted in Breakfast, Breakfast/Brunch and tagged Breakfast, Chocolate, chocolate chip muffins, Dorie Greenspan, easy, muffins on April 1, 2014 by dawn of food.